With its myriad of colourful leaves against the backdrop of cool breezes and clear skies, autumn is definitely the most beautiful season in Russia, yet it has always invoked mixed feelings among the country’s great writers. Yellow and gold are the predominant colours of foliage in the Russian autumn as depicted in artist Isaak Levitan’s oil on canvas masterpiece “Golden Autumn.” Artists felt particularly inspired by the colours of the season but autumn, with its harvests, unpredictable weather and traditions such as mushroom and blueberry picking tended to invoke mixed emotions among the country’s great writers. For some great writers, autumn was a gloomy season, one that was often compared to the autumn of life. The season invoked nostalgia and childhood memories for Fyodor Dostoyevsky, but also a degree of glumness with the contemporary reality that life was indeed passing by. He expressed these feelings, like in most of his books, through its protagonists. In her letter to Makar Devushkin, Dostoyevsky’s protagonist continues to vividly describe the season in the countryside and the “golden time” that was her childhood. Dobroselova goes on to write: “Carried away by these memories, I could weep like a child. Everything, everything comes back so clearly to my recollection! The past stands out so vividly before me! Yet in the present everything looks dim and dark! How will it all end?–how? Do you know, I have a feeling, a sort of sure premonition, that I am going to die this coming autumn; for I feel terribly…” In his later books, Dostoyevsky would continue to draw metaphors from the season. “The world of fancies will fade, dreams will wilt and die and fall like autumn leaves from the trees,” he wrote in White Nights. “Just as a painter needs light in order to put the finishing touches to his picture, so I need an inner light, which I feel I never have enough of in the autumn.” Many have attributed that quote of Leo Tolstoy to a writer’s block that he felt in the season. 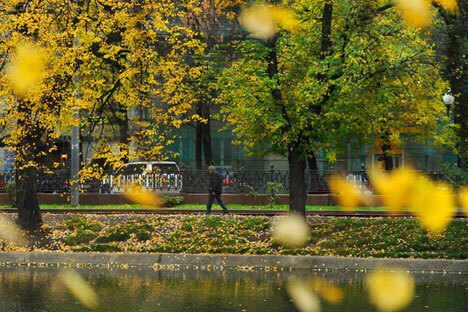 In Reminisces of Anton Chekhov, Maxim Gorky compared the stories of Chekhov with the late-autumn. “Reading Anton Chekhov's stories, one feels oneself in a melancholy day of late autumn, when the air is transparent and the outline of naked trees, narrow houses, greyish people, is sharp,” Gorky wrote. Autumn struck a particular chord with the greats of Russian literature and reading little gems about the season that are tucked away in sometimes hidden corners of large novels, is just one more way of trying to discover the depths of the Russian soul. No matter what kind of emotions the season actually evoked in the minds of the legends, the colours, smells, sights and sounds of autumn actually brought out the descriptive and creative best in them.